The Fox Pro Crossfire is portable, lightweight, and easy to operate. 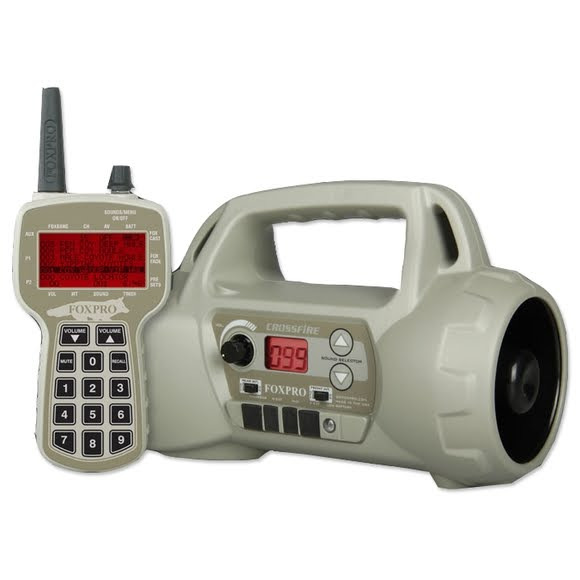 The CROSSFIRE comes standard with 75 high quality FOXPRO sounds and can hold up to 500 sounds. The CROSSFIRE features dual amplified speakers to deliver incredible volume. The front horn speaker handles your coyote vocalizations and common distress sounds with ease. The Fox Pro Crossfire is portable, lightweight, and easy to operate. The CROSSFIRE comes standard with 75 high quality FOXPRO sounds and can hold up to 500 sounds. The CROSSFIRE features dual amplified speakers to deliver incredible volume. The front horn speaker handles your coyote vocalizations and common distress sounds with ease. The rear cone speaker handles the low frequency sounds such as bear growls, owl sounds and even mountain lion sounds. When combined, they deliver a crisp, clear, high quality and realistic sound. If you want even more volume, the CROSSFIRE allows you to connect two external speakers for incredible volume capabilities, has a charge jack, and auxiliary jack to connect an approved device such as a FoxJack decoy. The CROSSFIRE comes with the TX-505 remote control. The TX-505 has an extra-large display screen, numeric keypad, FOXBANG technology, FOXFADE, and the capability of storing and playing up to 10 custom presets and sequences. FOXCAST allows you to pre-program up to 10 sequences where you can program the sounds, volume levels, durations and passages of silence for hands free operation throughout the entire stand. FOXFADE allows you to control the volume independently of two sounds playing at the same time. Use the A/V (Auto Volume) feature to allow the volume of a sound to slowly ramp up and then modulate up and down, leaving your hands free from making manual volume changes. The CROSSFIRE is backed by a 5 year limited warranty and FOXPRO&apos;s unmatched customer support and is proudly made in the USA. With FOXBANG activated the caller automatically switches to your preset #1 after discharging your firearm. This allows for hands free sound changing operation to help keep your eyes focused on the field where it counts. Individually amplified horn (front) and cone (rear) speaker combination provides loud, crystal-clear audio and great frequency response. Operate up to 16 different units from a single remote. Use the Crossfire with the remote or choose to operate it manually from the controls located on the front. Don&apos;t like scrolling through your sounds? Directly enter the number of the sound you wish to play on the numeric keypad for direct access. For those that prefer the scrolling, the rotary selector knob allows you to scroll through sounds without the need for memorizing your sound list. Store up to 10 custom sound presets with individual volume levels. Two quick access preset buttons are located on the side of the Crossfire remote. Design up to 10 entire stands including the individual sounds, volume levels, durations, and passages of silence. When selected, a custom sequence will go through the steps you defined and complete your entire calling sequence without requiring any need for using the remote control. Manipulate the volume level of the L/R channels on a stereo audio file. For example, if you are playing a sound that has a rabbit on the left audio channel and a coyote on the right audio channel you can use FOXFADE to gain independent control of volume of both sounds within the stereo audio file (i.e. decrease the volume of the rabbit--or silence it completely--while the volume of the coyote remains the same or vice versa.) In mono operation, FOXFADE will act as a mixer moving sounds from the front speaker to rear speaker. Dimensions 8" x 4" x 6"